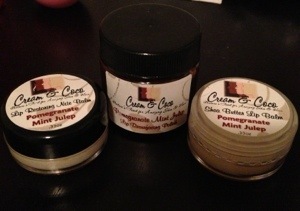 Today’s review is Cream & Coco‘s Pomegranate Mint Julep lip care set. I was excited about getting a lip scrub. I remember back in the days Oprah recommended brushing your lips with a soft bristle toothbrush as a way of exfoliating them. What could be better than exfoliating them with sugar?! I love the scrub, the smell is delightful, I try not to let it get in my mouth though. The oils in it seem to come to the surface when it’s in the jar, so I mix well before applying the scrub. I would recommend using the scrub over the sink because grains of sugar do fall. After using the scrub, I’m left with soft, moisturized lips. My one wish is that there was a little slot on the side of the scrub to store the spatula. It’s fallen and gotten lost so many times… especially since it’s clear in color. I like that the day lip treatment has a white top and the night lip treatment had a black top. This eliminates confusion (or even taking the time to read) about which one is for day use and which one is for night use. I find the day treatment to be more moisturizing than the night one, so I use that one more. Definitely enjoying the lip care set. I’d say it’s worth trying. Where did you purchase and what’s the cost? I completely forgot to link the site. Thanks for the heads up!